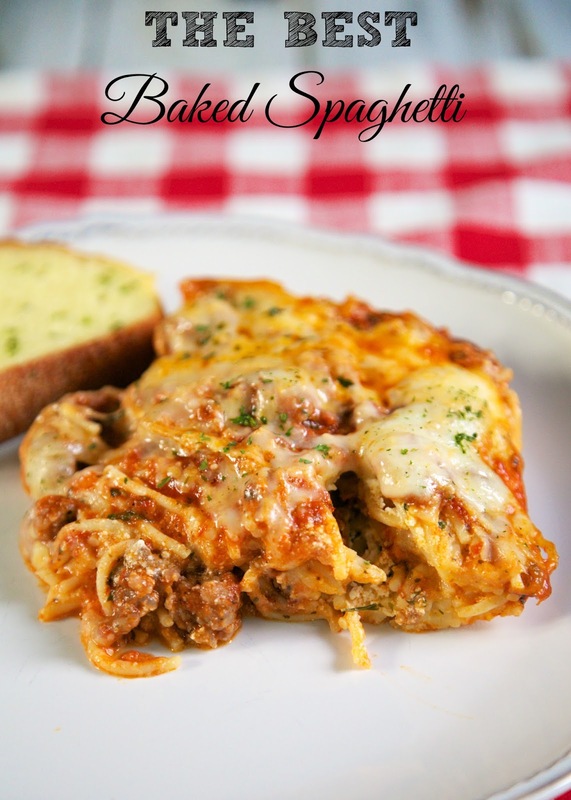 The Best Baked Spaghetti - delicious spaghetti casserole! Hamburger/Sausage, spaghetti sauce, eggs, parmesan, pasta, ricotta, sour cream and mozzarella. Also makes a great freezer meal! 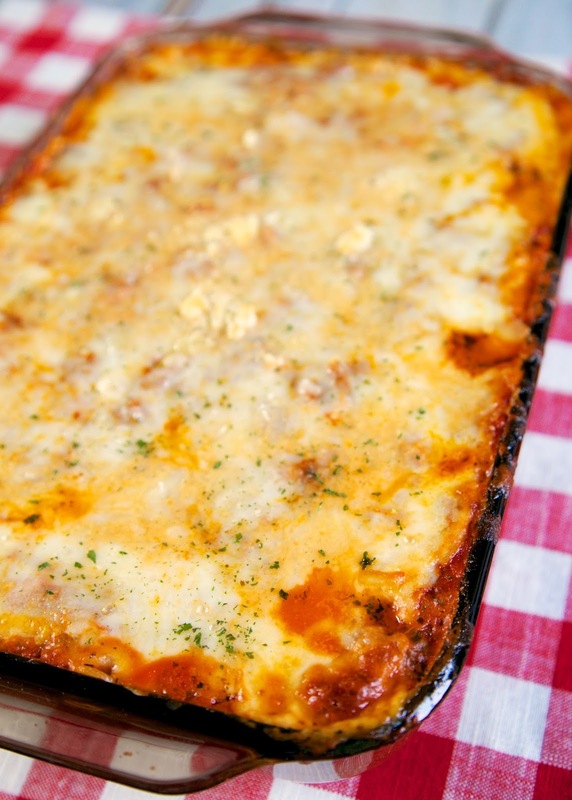 I love Baked Spaghetti casseroles. I made this casserole so Chicken Legs would have something to eat while I was in Europe. We ate this for dinner and I cut up the leftovers and froze it for Chicken Legs. This is SO good and super easy to make. You can make this casserole ahead of time and freeze it or refrigerate it until you are ready to serve it. This is a great dish for a crowd. It will easily serve 10-12 people. Just toss together a salad and some Garlic Roll Cupcakes for a quick and easy Italian feast! Cook spaghetti according to package directions. Drain. Whisk together eggs, parmesan cheese and melted butter. Toss with pasta. Set aside. Combine ricotta, parsley and sour cream. Set aside. Combine spaghetti sauce and cooked sausage/hamburger. Set aside. Layer half of pasta mixture, half of ricotta cheese mixture, half of meat sauce and half of mozzarella. Repeat layers. Cover pan with aluminum foil and bake 35 minutes. Remove foil and bake an additional 10 minutes (until cheese is bubbly). One look at the pictures and I was instantly drooling....excuse me while I grab a tissue LOL. This looks and sounds amazing!!! I must try this soon!! Could you use cream cheese instead of Ricotta? I always have cream cheese on hand but never ricotta. I would think that cream cheese would get too thin once it melts. I substitute cottage cheese for ricotta all the time though. When do you add the Italian seasoning and garlic powder? lol I was thinking the same. I'd add it when you mix the sauce/meat together. i don't see italian seasoning or garlic powder listed in the recipe, am i missing something? help!!! i'm making tonite!! This recipe doesn't have garlic or Italian seasoning. You can certainly add some to the sauce if you would like. It wouldn't hurt the recipe. Enjoy! This looks tasty! Love a make ahead meal that looks that good. I made this ahead of time and refrigerated it. What is the best way to reheat this? Looks yummy! I ended up reheating it in the oven at 350 for around 25 minutes. Is there a better way to do it? It tasted really good but I think I evaporated? a lot of my sauce. Any advice? My super picky six year old even liked it and I want to make it again! i have no ricotta or cottage cheese...think it will be ok without either? Only two people live in my house. If I make half the recipe, will it fit in a 9x9 pan, or cause it to overflow? Needs twice the amount of sauce...or it is too dry. Is that fresh parsley or dried parsley. That much, my guess would be fresh. I made a half recipe and put it in an 8x8 pan (there were just two of us), and I still had enough leftover for 4-6 servings (it's very thick, but very good)! Next time I would add additional sauce, but that would be my only change. Thanks! When it says parmesan, I'm assuming it is shredded cheese...? shredded or grated Parmesan - either will work great. Enjoy! Possible to leave out the Sour cream? I have some ricotta on hand but no sour cream. You can certainly try it. Sounds good to me. Enjoy! This is delicious. I've made it 4 times now and my family all love it. I make it exactly as called for, using Italian sausage and Kroger brand tomato basil sauce. The first time, I thought the amount of sauce wouldn't be enough, but after trying it, it was fine. If you like a lot of sauce on stuff like this, you could probably use a jar and a half, but it's not necessary otherwise. Excellent recipe! I just used Italian seasoning and it tasted great! I have an egg allergy in my house. How can this be made without the eggs? It looks delicious! It sounds like a yummy dish, I'm married to an Italian so would definitely add the minced garlic and the It. seasonings & never skimp on the cheese! I really like this recipe. Next time I will make double the sauce and meat.... keep half out to serve with casserole. Can spoon on top. Maybe use all Italian sausage for my husband. That would be 2 jars and 2 lbs of meat. You can never have too much meat sauce! Glad you enjoyed it! !